a. 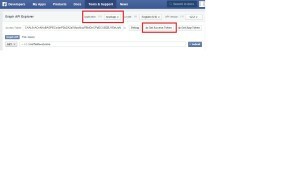 Create a facebook account and login to that account. e. The added app is shown under Menu.Click it, It opens the Dashboard of the app.Take a note of AppId and AppSecret. where mention AppId and AppSecret of your app as shown on App Dashboard. Another way to obtain short lived token is to naviagete to url https://developers.facebook.com/tools/explorer?method=GET&path=me%3Ffields%3Did%2Cname&version=v2.2 and select your app in Application and press “Get Access Token” button. where mention AppId and AppSecret of your app as shown on App Dashboard.EXISTING_ACCESS_TOKEN is the temporary token generated for 2 hours.Copy it from Step 1. // get remaining info from posts,comments by parsing the data.